The process of writing an honors thesis is a long, arduous, and stressful one, but the culmination of the work—often in a bound hard-copy black book, with gold trim and professional-looking double-spaced pages—is, for many, worth the months of effort. 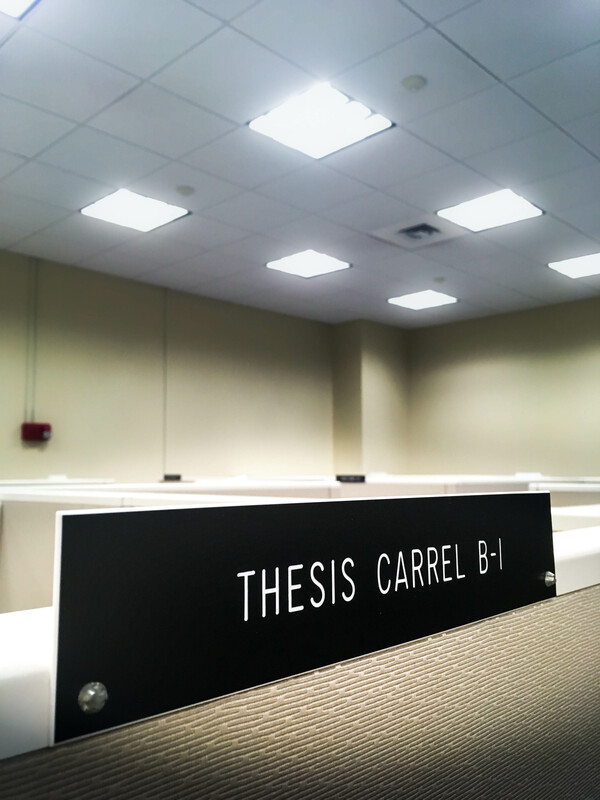 This semester, seniors who are writing honors theses will see their efforts come to fruition in mid-April. Written theses will be bound and processed, and students have the opportunity to take home copies for themselves and their families. Of course, the rest of the world is supposed to be able to read theses, too. The University preserves a large collection of student-written theses, which are available in two distinct forms, and each form has a different level of access and means through which students can read them. The main storage area for student theses is with the University’s Special Collections Department, located on the first floor of Olin Library. The University preserves a single copy of almost every honors thesis written since the 1930s, which are kept in the University’s archives collection. Some early theses are arranged by department, while the more recent ones have been arranged by year and author to promote ease of access. Theses are non-circulative, meaning a student cannot check one out to read in their preferred location. Theses are instead treated as manuscripts, and like other objects in the University library’s Special Collections department, students can request to read a thesis in advance via a retrieval form. The student can then read it in the Special Collections & Archives Reading Room, located in Olin Library, where students aren’t allowed to have food or drinks, and can only take notes with a pencil. As such, theses are maintained in a way that promotes long-term preservation. University Archivist Leith Johnson, who works on the maintenance of student theses, notes that this method protects theses from the effects of frequent handling and misuse. The Special Collections & Archives Reading Room is also used regularly for other rare, fragile, or notable pieces of literature in the University’s collection. This includes first editions of many books, and a collection of artist’s books, which are unique, hand-bound books made by Wesleyan students and affiliates. In addition to their regular storage spaces, Special Collections keeps a few copies of senior theses related to University history available in the foreground of the Special Collections room. In addition to physical copies, the University’s library maintains online copies of theses on its database WesScholar. Hundreds of theses can be obtained and read as full-text documents via this system, though it often takes months for theses to be uploaded after submission. Students can opt out of this system, but according to Johnson, around 90 percent of students opt to include their thesis on WesScholar, as it allows for other scholars and potential employers to access them. Some students, however, do opt out of WesScholar, at least for some amount of time. Student Jenny Davis ’17 chose not to include her English thesis on WesScholar, and student Thienthanh Trinh ’17, who wrote a thesis in the Biology Department, explained that a potential reason for delaying accessibility on WesScholar could be interest in publishing one’s thesis in a journal. For other students, WesScholar is a method through which their theses receive attention. In some cases, theses are accessible not just via WesScholar and Special Collections. Students will occasionally donate theses to their respective departments, thesis advisors, or to various campus organizations. You might have seen the theses located in libraries of different departments, where many are kept on display. Rather than tuck theses away, some departments will make them more available for students to poke around and explore. Alpha Delta Phi, for example, maintains an assorted collection of theses written by members of the fraternity, which are available for students to read in one of the main rooms on the first floor. Administrative Assistant for the English Department Liz Tinker explained that, while the English Department has no formal method of maintaining theses, some copies do still exist. “We do have some old bound copies but only from students who thought to give us one or from retired faculty who were given copies,” she wrote in an email to The Argus. Most notably, the University’s Science Library has multiple shelves of hundreds of students’ master’s science theses and doctoral dissertations, organized by department and spanning decades, with some of the earliest copies dating from the 1930s. These theses are made more accessible to students who are both interested in University science research and who are looking to cite Wesleyan research for their own projects, bypassing the longer archival system. No student senior theses are available in the Science Library, and each of these master’s and PhD theses have an alternate copy that’s preserved in the Special Collections Department. University Science Librarian Melissa Behney explained that until recently, the Science Library would receive a physical copy of master’s and PhD science theses, which were then stored on these shelves. This change matches the use of WesScholar for undergraduate research theses, as master’s and PhD science students now have the option of uploading their theses to the online database. Behney also explained that because the copies in the Science Library are considered “second copies,” there isn’t a major system of upkeep. Although theses are available in the Science Library and other locations throughout campus, the primary means through which theses are accessed remain via WesScholar and the University’s Special Collections Department. Both allow reading access to theses, while maintaining their pristine status. Current students working day and night on their theses can rest easy, knowing they can expect that at least one physical copy of their hard work, alongside a digital one, will be kept for decades to come.